Did you know that there are many dolphins living nearby, in the Potomac River and Chesapeake Bay? Researchers from the Potomac-Chesapeake Dolphin Project (PCDP) have set out to better understand them. Dolphins have been sighted in the Potomac as far back as the 1800s and as far north as DC but many people are still unaware of their local presence. Janet Mann, vice provost for research and a professor in the Georgetown biology and psychology departments, is co-directing this marine science endeavor with Eric Patterson, an assistant research professor of biology. They’ve been learning about the animals’ population structure, distribution and disease risk, among other factors and qualities, since 2014. “There are a lot of questions. Are the same animals coming back? Where do they go? How stable are the groups? Who are they with? What are they feeding on?” Mann asks. She has spent much of her career traveling to Australia to study bottlenose dolphins in Shark Bay. Her husband convinced her to find a vacation cottage on the Potomac to unplug from work. Much to their surprise, they were quickly greeted by dolphins in the backyard. “My husband is a patient man. We’ve turned what was supposed to be a little retreat for us into a field station,” Mann says in a Georgetown press release. One of the main inspirations for the founding of PCDP was the tragic death of more than 1,000 East Coast dolphins between about 2012 and 2014, due to the morbillivirus. Mann felt that if the project had already been underway at that time, it could have been helpful and provided insights. 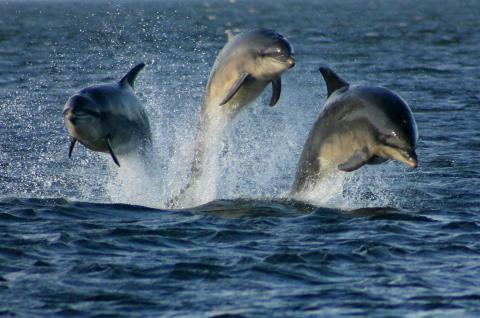 The Potomac-Chesapeake Dolphin Project’s mission is now “to better understand and protect the bottlenose dolphins (Tursiops truncatus) of the Potomac River and Chesapeake Bay.” PCDP is carrying out the first major research project focusing on the dolphins in the Potomac and Chesapeake Bay, the largest estuary in the United States. So far, as of May 2017, Mann and the team of graduate and undergraduate researchers have observed more than 500 dolphins and they think there may be closer to 1,000. They estimate the overall population is likely much higher than those they’ve seen, given that their sampling is monthly and in a limited geographic area. While on board the project boat named Ahoya, the group has learned that the Potomac is an important area for breeding and birthing. “We know they’re giving birth in the Potomac and the Chesapeake; we see tiny babies just a week old or less,” Mann tells The DCist. The dolphins’ eating habits, where they migrate in the winter and many other questions remain unanswered. About one-third of the animals are repeat visitors. They’ve been given apt and amusing names, like “Hillary Clinton,” and “Lyndon Johnson.” Supreme Court justices and speakers of the house are also being awarded marine namesakes. Meet and peruse photos of some 200 members of the identified Potomac-Chesapeake dolphin community here. Dolphins are known to be both a flagship (popular ambassador for an ecosystem) and indicator species. Being an indicator species means that their health is a good measure of the well-being of the waters they inhabit. As reported by the Potomac Conservancy in its “State of the Nation’s River,” publication, the Potomac River is considered to be in a state of ongoing recovery. “Pollution levels are decreasing, fisheries are rebounding, and more people are getting outside to enjoy the river,” the clean-water advocacy nonprofit explains. Good news: the Potomac’s 2016 “report card” is a B-. That’s an improvement over a C in 2013 and a lot better than the D the river received in 2011. Along with the endearing dolphins, the Potomac Conservancy shares that after many years of decline, the river is now home to growing populations of game fish, including white perch and shad. However, while pollution levels are sinking, tidal grass habitats still have a ways to go before they are in line with the Environmental Protection Agency’s restoration goals. If you’d like to get involved with the Potomac-Chesapeake Dolphin Project, there are opportunities available to contribute GPS information, photographs and sighting data. You can also stay up to date with PCDP’s research and community engagement on Facebook , Instagram and Twitter.